blog.HalloweenAdventure.com | Latest News from the Costumes Trend FrontLines! : Scooby Dooby DOOOOO Costumes! This Halloween, pay homage to the best doggy around: Scooby Doo! Scooby and his ragtag gang of mystery solvers are one of the nation’s most beloved crime teams. Before CSI and Law and Order, there was Fred, Velma, Shaggy and Scooby, and we’ve got the costumes to help you replicate them! The best way to start? With Scooby himself of course! 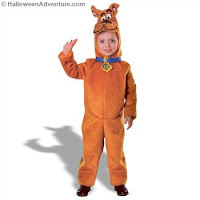 Our Scooby Doo Deluxe Children’s Costume is absolutely irresistible. It comes with jumpsuit, dog collar and headpiece. We’d recommend practicing your barking and your “Scooby dooby doooooo!” before collecting candy. Scooby’s lovable sidekick (or lovable owner, depending on how you see it) is the always-admirable Shaggy. 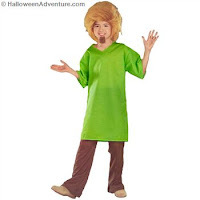 Our Scooby Doo Shaggy Children’s Costume comes with a Shaggy Wig, goatee, green shirt and brown pants. Those who really want to hit it out of the park will adore our Scooby Doo Super Deluxe Velour Movie Costume for Toddlers. This one transforms your tot into a doggie with a velour front zipper jumpsuit with attached character headpiece, collar, and tail. This is an official Hanna-Barbera costume. 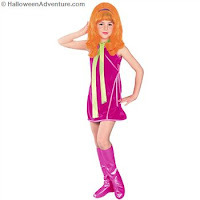 Girls will adore our Scooby Doo Daphne Children’s Costume. It’s for mini fashionistas, and comes complete with Daphne’s signature magenta minidress, magenta boot tops and orange wig. Adults will love our Daphne Adult Costume. With a bright orange wig, magenta mini dress, boot tops and a light green scarf, this outfit turns you into a mystery solving fashionista that isn’t to be missed! Always the smartest of the bunch, Velma was the one who put some thought into the Scooby Doo mysteries. Our Scooby Doo Velma Children’s Costume comes complete with brown character wig, fake glasses, orange shirt and red skirt. For more old school costume ideas, check out Halloween Adventures online!